There's been a lot of controversy in Cambridge over the parking charge for our Park and Ride service. A few years ago, the council introduced a car parking charge. To say it didn't go down well is a bit of an understatement. Locals were outraged, not only by the charge, but the pain and complexity involved in paying for it. Recently, a plan has come about whereby the charge would be scrapped. 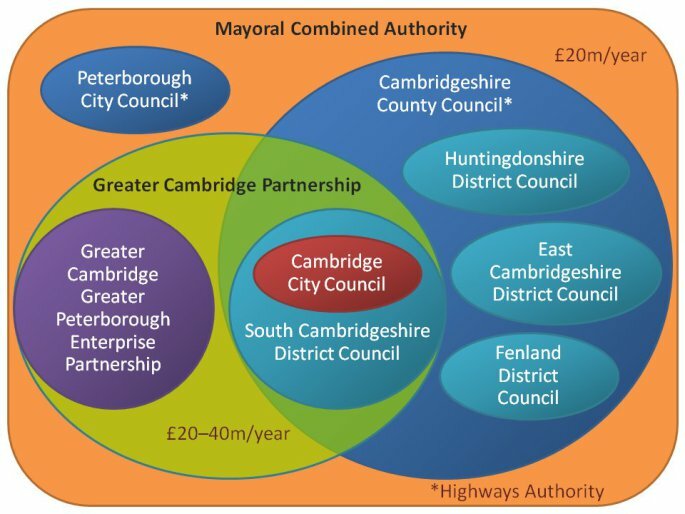 Essentially, the Greater Cambridge Partnership would use some of its funds to ensure Cambridgeshire County Council wouldn't take such a financial hit if the charge was removed. Now, I'm opposed to the charge, but I'm not convinced by the solution. Let's be clear. That's the abridged version. It doesn't include parish councils, MPs, national government, transport operators, or many other interested parties. Looking at the structure, is it any surprise that our transport is an inconsistent and disorganized mess? There's no evidence of joined up thinking, and essentially every transport project is a point solution blind to the wider picture. To my mind, the parking charge is evidence of this disconnect. It shows that rather than running a Park and Ride system, we have some car parks run by the council, and a completely separate bus service run by the bus companies. That the buses actually stop at the car parks is a fortunate coincidence; the whole thing isn't part of a coherent plan. It gets worse, as the Park and Ride system is distinct from the general bus service. Special buses, special routes, special tickets. Again, an isolated point solution that isn't run as part of a larger plan. So what is the answer? Ultimately, you need to get the system sorted out. We need a coherent transport infrastructure rather than everyone pulling in different directions. To the specifics of the charge, the pain point is paying twice. It's not the direct cost, it's the extra hassle. So pay once. Either have free parking and have the bus ticket cover the cost, or pay to park and make the bus free. A deeper question is whether the Park and Ride system is actually useful and whether alternatives such as Travel Hubs might work better; or whether it might actually make sense to run bus services to where people live so they don't have to drive at all. But my bigger concern about the discussion of parking charges is not just that it's leading to bad answers, but that in looking at it in isolation we're ignoring the fact that we're answering the wrong question.